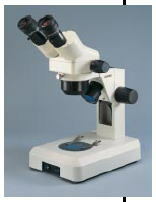 CSM2 is a basic 2-step Stereo microscope designed for rugged environment. Optimal imaging, color and clarity is provided through a fully enclosed optical system, which produces erect 3D images. Examination of opaque as well as transparent specimens is made possible through top (reflected) as well as bottom (transmitted) illumination system. With a choice of stands, extension arms and accessories such as Dark field attachment, Polarizing attachment and a wide variety of Eyepieces, CSM2 can be configured for Industrial application providing optimum utility. With its sturdy stand, high performance objectives (1x/3x, 2x/4x), High eyepoint focusable eyepieces with optional reticle holders and a 45?inclined observation head, CSM2 provides working convenience unmatched in its product class. Dual light stable stand with focussing knobs. Provided with built in illumination both for incident light(12V 20W Halogen) and substage transmitted light(12V 10W). Both the lights can be used individually or simultaneously. Paired 1x-3x or 2x-4x objectives revolving on turret mount with quick indexing. Focusable WF 10x(FN 18). Optional WF 10x (FN22), WF 16x (FN16), WF 20x (FN12) with fixed or focusable movement. Sub-stage 12V-10W halogen transmitted light. 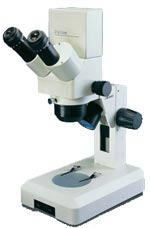 Modular stereo zoom Binocular and Trinocular microscope with a distinct combination of optical performance, flexibility and exceptional value. 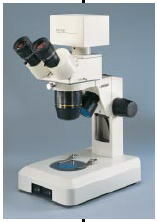 Designed with the Greenough optical system, CZM4 provides distortion free high resolution erect 3D images. 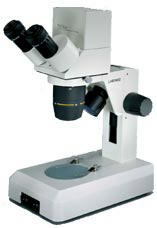 The lateral zoom control adds convenience to operation.The choice in viewing-heads, stands, illumination and accessories accommodate a wide variety of operating conditions.At an economical price, the new CZM4 offers a basic platform for Zoom Stereoscopic format for industrial as well as eductional needs. A hot of accessories such as Auxiliary lenses, Digital camera attachment and a variety of stands make CZM4 the best choice of OEM requirements. 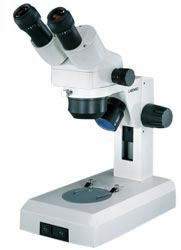 Dual light stable stand with focussing knobs.Optional stands with fluorescent light, Boom stand,with bonder arm, large mechanical stage to inspect 6?wafer size, Pillar Type Stand. Binocular or Trinocular observation head inclined at 45°. Provided with built in illumination both for incident light(12V 20W Halogen) and sub-stage transmitted light(12V 10W).Optional Fluoroscent Light. Focussable WF 10x (F.N. 20). Optional WF 10x (FN22), WF 16x (FN16), WF 20x (FN 12) with fixed or focussable movement. Darkfield attachment, Polarising Kit, Ring Light, Fibre Optic Illumination. light and Sub-stage 12V-10W halogen transmitted light. 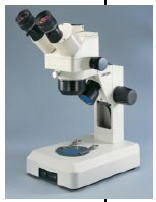 DigiStar is a basic 2-Step Digital Stereo Microscope for rugged environment. Optimal imaging, color and clarity is provided through fully enclosed Optical system, which produces erect 3D images. With its sturdy stand, high performance objectives (1x/3x, 2x/4x), High Eyepoint focusable eyepieces with optional reticle holders and a 45°inclined observation head with built-in Digital Imaging Module, Digistar provides working convenience unmatched in its product class. The Digital module provides two video output ports i.e. Composite video for TV monitor etc as also USB v1.1 for Computer connectivity. Offered with Labomed DIGIPRO?v2.0 Imaging software which give added advantage of image capturing, analysis and measurments of the specimen being observed. sub-stage 12V - 10W halogen transmitted light. The new DigiZoom offers versatility and performance for various applications at an affordable price. The DigiZoom features a 1:4 zoom ration with lateral controls. The binocular head is inclined 45 degrees and has a low lux 1/3"CCD built in image sensor. Magnification is variable from 10x?0x. An optional 2x auxiliary lens is available that increases magnification from 20x?0x. A certified UL-CE dual built in halogen illumination system allows for both incident and transmitted light. 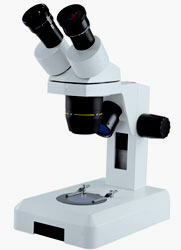 The microscope also has an S video out and images can be viewed on either a computer or video monitor. 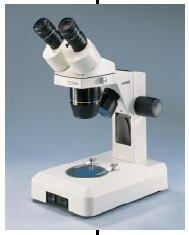 It features outstanding optics and is ideal for critical viewing in educational, medical or industrial applications. Easy to install plug & play DigiPro image software is included. The software provides instantaneous live video on your computer along with user friendly image capturing, processing, movies and measurement capability.